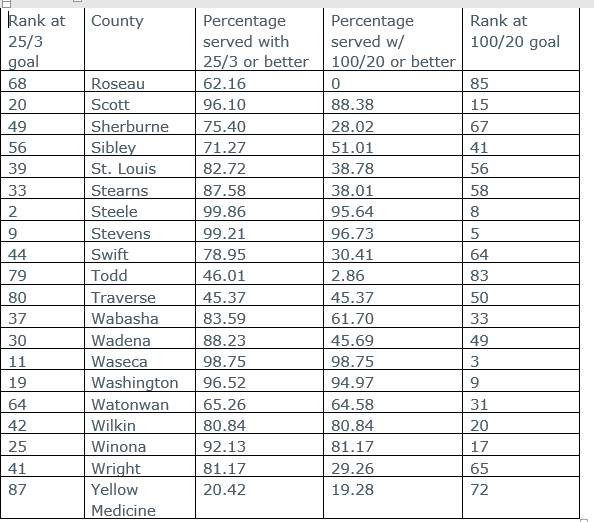 In 2014, 46 percent of Roseau County had access to broadband. (Broadband was defined with lower speeds back then.) Today 62 percent of the county has access to broadband speeds of 25/3 (Mbps down/up) and 0 percent has access to the 2026 speed goals of 100/20. I have to be suspect of zero access to 100/20 since is sounds like a part of an ARRA project in their area was for FTTH but perhaps none of those FTTH locations were in Roseau County. Although the they have also been in line for some FTTH through State supported projects. This $7.4 million grant to Wikstrom Telephone Company, Inc. will deploy 414 miles of new cables and electronics for GPON fiber to the home in 6 communities of Kittson, Marshall and Roseau County for Broadband Services over 100 megabits. Electronic enhancements will be made to existing DSL customers to increase Broadband speeds up to 48mbs, along with 74 miles of additional fiber to the node, and a 150mb microwave upgrade for service to the NW Angle. Wikstrom Telephone’s project stands to benefit approximately 12,000 people, 1,500 businesses, and 83 other community institutions. In addition to the jobs this project will create upfront, it will help drive economic development and create jobs for decades to come. 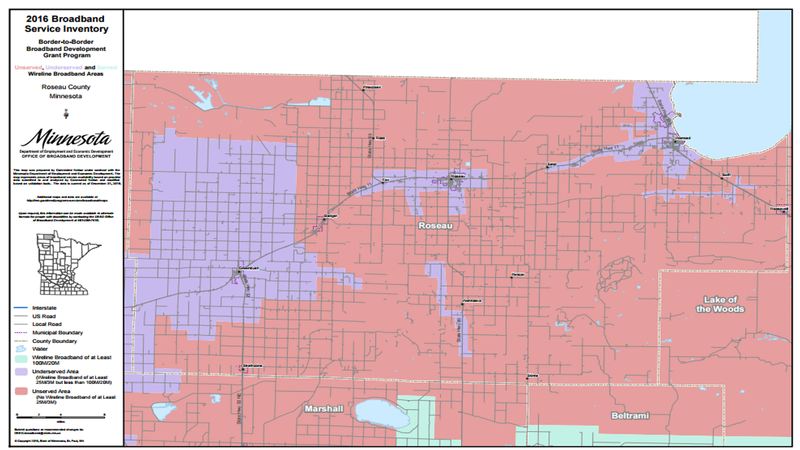 Sjoberg Cable, Broadband Grant Proposal. Awarded $261,575 to provide broadband services to 107 unserved and 49 underserved locations using fiber-to- the-premise technology, predominantly in extremely rural and agricultural areas. The project would build-out in five areas in Roseau County near Roseau, Warroad and Salol. The total project costs are $523,150; the remaining $261,575 (50 percent local match) will be provided by Sjoberg’s Inc.
Wikstrom Telephone, Kittson, Marshall, Roseau Broadband Extension. Awarded $425,000 to bring fiber-to-the-home service to 73 unserved and 43 underserved locations in Kittson (15 premises), Marshall (50 premises) and Roseau (51 premises) counties. The total project costs are $943,827; the remaining $518,827 (55 percent local match) will be provided by Wikstrom. Unfortunately, either that work was not yet completed in July 2016 (when last measured) or the upgrade wasn’t enough to set them up for the 2026 speed goals. Roseau County is in line to receive $847,823 in CAF 2 funding to upgrade 1648 locations. CAF 2 recipients are only required to upgrade to 10/1 access. Many may choose to upgrade to better speeds but there are no requirements. DDI score of 49.73 out of 100.